We all hit the bed hoping that it would dawn sooner or later. We envision the sparkling Sun extending its yellow hands by way of enigmatic beams. We dream of a better day ahead where appreciations flow for our good work and goodwill spreads. We dream of earning and saving. We further dream about building a tiny empire for ourselves in this majestic World. A tinge of tear rolls down from eyes like a pearl emerging from the oyster. We rub it aside like a bead of sweat with a sweet smile. We sigh and we continue to smile. After all, the dreams have come true. We close our eyes… For a dreamless sleep!!! Ahh! 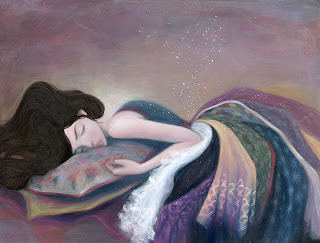 !...I love that image....and beautiful post on dreams....Lovely! nice post.. lovely verses.. and beautiful pic..
Beautiful take on the prompt... and the picture is very pretty! I get disturbed dreams when I am not well otherwise I sleep soundly without any interruption of dreams. Dreams make us fly high and touch the skies - dreams can certainly do that. Nice. Absolutely brilliantly take on the prompt and love ur expression of dreams. Was great reading u during the contest.